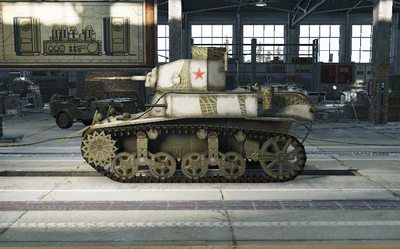 The M3 Light Tank was the Lend-Lease version of a beloved American light tank put into Soviet service. The M3 Light Tank has a standard view range of 280m, so scout tankers should equip either Coated Optics or the Binocular Telescope to maximize their spotting potential. Want to try the M3 Light Tank for free? Check out the rental missions! Your job is to stay intact and probe the enemy’s defenses. Traverse the battlefield and spot enemies. Use bait-and-switch tactics when appropriate to entice your opponents to overextend into the supporting fire of your teammates. You've got lots of shells in your locker, but choosing your loadout is important -- while standard shells can do the job, you may need Premium shells to penetrate higher tier vehicles, and a few High Explosive rounds always come in handy to reset a base capture attempt! Don't forget to check the minimap frequently to figure out where you'll be the most effective! Large Repair and First Aid Kits actually reduce the chance of damage or Crew injury. While you can use Extra Combat Rations instead of the Fire Extinguisher to improve your overall performance in battle, this presents a large fire risk. Keep in mind that consumables need to be replenished after each battle if used, while food or gas items are used automatically. Increase your stealth with Improved Ventilation, and your accuracy with Enhanced Gun Laying Drive then equip either Coated Optics or a Binocular Telescope to maximize the tank's already good view range.